Originally designed in 1974, the Neve 2264A mono Limiter/Compressor unit quickly became a legend. The original 2264A units are still sought after, decades after production stopped, and they remain one of the milestone pieces of studio equipment. The celebrated Neve 2264A Limiter/Compressor is now 500-series compatible. One of very few audio processors in possession of the unique ability to improve a sound simply by running signal through it, the Neve 2264A mono Limiter/Compressor quickly achieved notoriety among studio professionals as a secret ingredient to success thanks to its unique sound and functionality. Neve’s engineers built the new 500-series 2264ALB to retain as many of its predecessor’s sonic characteristics as possible. Designed for use in recording studios, and for broadcast, the Neve 2264ALB Limiter/Compressor can also be used to protect transmitters from overloading. A totally individual sound finds its foundation in Class A/B design and transformer-coupled circuits used in the input, sidechain, output stages and pioneering bridge-driver design. The 2264ALB’s main advantages are its reduced size and 500-series power rack compatibility. In addition, it uses a more advanced circuit technique to produce a more precise response curve than its ancestor. 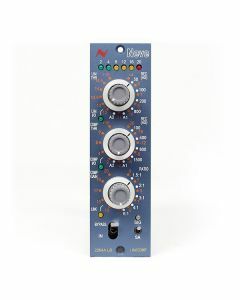 The Neve 2264ALB also has a switchable Slow Attack feature for applications like bus compression. An LED gain-reduction meter with three dual-concentric knobs controlling the limiter and compressor sections sits at the top of the 2264ALB front panel. The meter LEDs show the amount of gain reduction being applied to the signal, and have an approximate PPM characteristic. To hear the legendary benefits of the Neve 2264ALB to any audio creation, simply install into an empty slot in your 500-series rack, connect your line level signals and listen.